The Global Entrepreneurship Program (GEP) is a U.S. State Department-led effort to promote and spur entrepreneurship by catalyzing and coordinating private sector and U.S. Government programs to support entrepreneurs around the world. GEP was launched in April 2010 at the Presidential Summit on Entrepreneurship. It was then reinforced by the positioning of Economic Statecraft at the heart of the U.S. foreign policy agenda, online selecting entrepreneurship as an important economic tool, look developing economic opportunity and creating jobs in emerging markets. 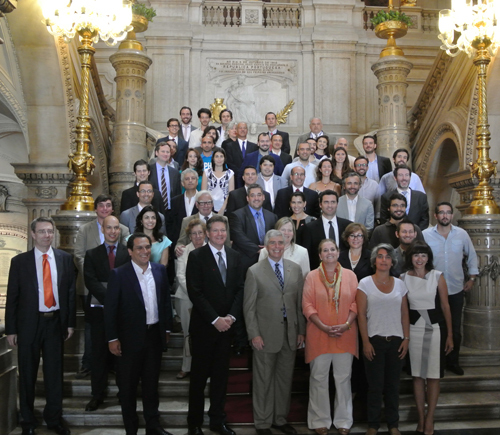 The U.S. Department of State Global Entrepreneurship Program (GEP) and the U.S. Embassy in Lisbon organized a high-profile entrepreneurship delegation that visited Portugal July 14-17, 2014. The Department of State emphasizes the importance of economic engagement in our foreign policy agenda to promote economic prosperity and job creation in the United States and abroad. The United States supports Portugal’s efforts to reform, restructure and open its economy. Development of a supportive entrepreneurial ecosystem will be a vital element of these reforms and can contribute strongly to Portugal’s economic recovery. The State Department-led U.S. delegation will included prominent, highly successful U.S. entrepreneurs and investors in the technology, finance, marketing, real estate and gourmet food industries. The delegation will met with senior Portuguese private and public sector officials to discuss key entrepreneurial opportunities and challenges in Portugal.